MUSICAL STAGES — Performing Arts Youth Academy presents "Les Misérables," on Jan. 18 to 20, Fridays and Saturdays at 7 p.m., Sunday at 2 p.m., at the HART Theatre, 185 S.E. Washington St., in Hillsboro. Epic, grand and uplifting, "Les Misérables School Edition" packs an emotional wallop and features exceptional vocal talent. Organizers call it a "not to be missed production." Tickets cost $13 and up. Visit stagesyouth.org for more information. DOUBT — Mask & Mirror Community Theatre presents "Doubt, a Parable," Jan. 18 to 20, and Jan. 25 to 27, Friday and Saturday, 7:30 p.m., Sunday 2:30 p.m., Tualatin Heritage Center, 8700 S.W. Sweek Drive. A drama of suspicion and innuendo by John Patrick Shanley, this powerful drama stars Sister Aloysius, a Bronx parochial school principal, who takes matters into her own hands when she suspects the young Father Flynn of improper relations with one of the male students. It is a gripping story of suspicion cast on a priest's behavior that is less about scandal than about fascinatingly nuanced questions of moral certainty. ?$10. Visit maskandmirror.com for more information. MACBETH — Forest Grove High School tackles English playwright William Shakespeare's famed tragedy, "Macbeth," for its winter drama production at Ellen Stevens Auditorium, 1401 Nichols Lane. Shows run on Jan. 18, 19, 25 at 7 p.m. and Jan. 26 at 2 p.m. Tickets cost $10 for adults and $7 for students. STEEL MAGNOLIAS — "Steel Magnolias" reels in the nostalgia from the play-turned-movie from the late 1980s. The classic takes to the stage in Forest Grove, Jan. 18 through Feb. 3 with shows at 7:30 p.m. Fridays and Saturdays, and 2 p.m. Sundays at Theatre in the Grove, 2028 Pacific Ave., in Forest Grove. Tickets are $16 for adults and $14 for seniors and youths. The box office is open on Wednesdays 11a.m. to 1 p.m. and one hour before each performance or at theatreinthegrove.org. ACOUSTIC ARTIST — Walters Cultural Arts Center presents Craig Carothers in concert, Feb. 8 at 7:30 p.m. at Walters Cultural Arts Center, 527 E. Main St., Hillsboro. A Walters' favorite with a loyal Northwest following, Craig Carothers began his career in Portland before relocating to Nashville where he performs his own music at famous stages like the Bluebird Cafe, and writes for artists such as Trisha Yearwood, Kathy Mattea, and Peter, Paul & Mary. His music is heartbreakingly beautiful and scathingly funny, delivered with a lively deadpan smile and a voice that's downright swoony. Discover why his performances over the years have been described as "truly magical," and experience the moving compositions of this home-grown talent with national appeal. Visit craigcarothers.com. Tickets cost $18 advance, $22 day of show. To find out more, visit hillsboro-oregon.gov/walters, 503-615-3485. SAKE — Forest Grove City Library invites you to learn about the craft of sake with SakèOne Brewing, Feb. 5 at 6:30 p.m., Forest Grove City Library, 2114 Pacific Ave., Forest Grove. SakéOne, America's first craft saké producer, and they've been brewing high-quality saké in Forest Grove for more than two decades. Learn about the art of Saké brewing and try a free sample or two! A 21 and over event. BLACK HISTORY MONTH — Beaverton City Library presents "Who I Am - Celebrating Me: A Black History Retrospective," Feb. 3 at 3 p.m., Beaverton City Library Main, 12375 S.W. Fifth St., Beaverton. You are invited to join us on a journey through the African-American experience. The World Stage Theatre, under the direction of playwright Shalanda Sims presents a montage of African-American figures and movements, past and present. In its thirteenth season, this masterful production employs song, dance, imagery, and spoken word. The performance will be followed by a conversation with the actors and the playwright. Free. To learn more, visit beavertonlibrary.org or call 503-644-2197. PRUNING — On Saturday, Feb. 16, a pruning demonstration hosted by the Tualatin Valley Garden Club and the Washington County Master Gardeners will take place from 9 a.m. to noon. Learn from the experts how to properly prune cane berries, grapes, fruit trees, roses, ornamental shrubs and trees. Tool sharpening available. One clean tool per person with name on a label. Please bring pruners and gloves for hands on experience. Hot coffee and cookies available. Located at 3850 SW Minter Bridge Road, Hillsboro. For more information, call Dave Russell at 503-648-4236 and leave your name and number. TRADITIONAL POWWOW — Portland Community College is celebrating the Native American culture and traditions with its 20th annual powwow at the Sylvania Campus. 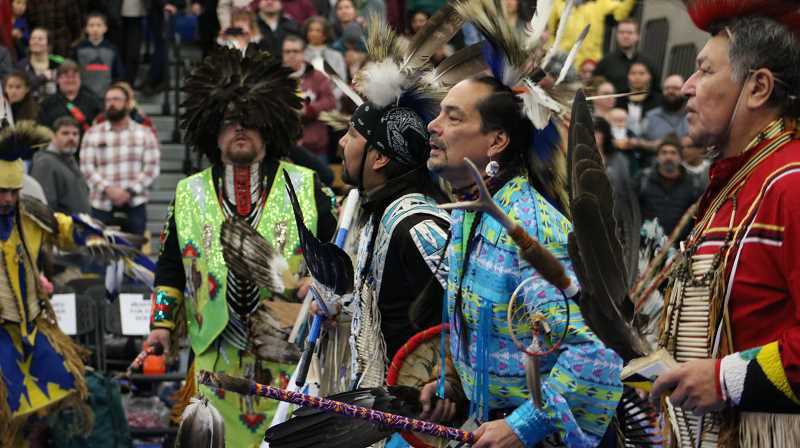 The "Wacipi" ("They Dance") Traditional Powwow is from noon to 9 p.m., Saturday, Jan. 19, in the gymnasium in the Health Technology Building (HT). Honored guests include master of ceremonies Bob Tom (Confederated Tribes of Siletz and Grand Ronde), whip man Carlos Calica (Confederated Tribes of Siletz), co-host drums Sitting Horse and Starhorse, and head dancers Ed and Vicki Wulf. This year's event will include grand entries at 1 p.m. and 7 p.m. and a free community dinner at 5:30 p.m. There will be a drum group, dancers, crafts, food, activities for children, a college fair and raffle prizes. Money raised from the event benefits PCC's Native American Scholarship Fund and vendor space provided by the college helps local Native American businesses. Admission and parking to the powwow are free. For more information, visit pcc.edu/powwow, or call (971) 722-4116.